If you missed the first posts in this series, go back to the beginning. If you read my blog regularly, I won Regional Dancer of the Year for Hollywood Vibe. It is a huge honor to be selected by the Hollywood Vibe faculty as the top dancer of the weekend, but moreover it qualified me to compete for the National Dancer of the Year during Hollywood Vibe’s Nationals Competition. 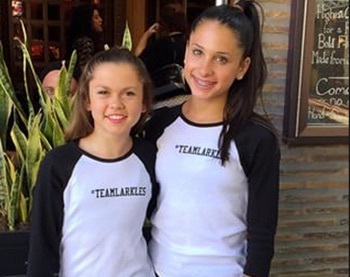 Hollywood Vibe held their week-long Nationals in LA and the talent and competition was fierce. It was not really a drama, but emotions ran high. I loved dancing with so many friends from around the Nation, like one of my besties, Leah Roga from Phoenix. Just for fun, our parents had #TeamLarkles shirts made for us since we plan to spend many weeks together, and #TeamLarkles was born! I tried to work as hard as I could so that I could dance well and show the teachers at the convention that I was deserving of the title National Dancer of the Year. I woke up my mom at 5:30 each morning to help me get ready so I could be there way before our call time 7:00 am. Liz Imperio, creative director of Hollywood Vibe taught me a lesson that I try to live by. She said that if your call time is 7:00 then 6:45 is “on time”. If you want to be early you need to be there at 6:30 am. I do my best to follow this rule whenever I am headed to a rehearsal or audition. At the end of the week, they called up the top 5 dancers to the stage. Then they announced the top 2 dancers in my Intermediate category to do a dance off. I made the top 2 list and it was very nerve racking, but exciting at the same time. The next morning the two of us got to dance for all of the judges at the event and a large audience. They didn’t tell us who won the award until the awards show that evening. At the end of the night, I was the last dancer standing and was awarded the Hollywood Vibe National Dancer of the Year! There were so many dancers deserving of the title that it was a shock to win! Hollywood Vibe is my second National Championship as a dancer. The first came three years ago at Hollywood Connection; they call their national prize ICON of the Year. Here’s a little known fact for you. Hailee Paine, one of the top 4 finalists on So You Think You Can Dance also won the Senior title of Icon of the Year at the same competition. I absolutely love her! She’s an amazing dancer and one of the nicest people in the world! I was sad that she did not win SYTYCD, but getting to the final two for Team Stage is a huge accomplishment. She really shined as a versatile dancer, often outperforming many of the Team Street dancers in Hip Hop pieces. Amazing, right? I’m so excited to see where her career is going to go from here!